Hazrat Maulana Rafiq Ahmad Shah Qureshi Fazali Naqshbandi Mujaddidi (born 1957) is the present sajjada-nashin (successor) at the noble khanqah of Miskeenpur sharif, in district Muzaffargarh, Pakistan, which was established by his grandfather Hazrat Pir Fazal Ali Shah Qureshi, may Allah be pleased with him. He is a maternal grandson of Hazrat Pir Qureshi, the founder of the Fazali Naqshbandi Order which has millions of followers worldwide. He was born in 1957 and is the third son of Mawlana Abdul-Rauf Shah Qureshi. His father was just 11 years old when Hazrat Pir Qureshi passed away from this world, and who later married the younger daughter of Hazrat Qureshi. Mawlana Abdul-Rauf was son of Mawlana Saeed Ahmed Shah who was nephew and a beloved disciple of Hazrat Pir Qureshi and used to be with him most of the time. One day, Maulana Saeed Ahmed was sitting close to his beloved shaykh Hazrat Pir Fazal Ali Qureshi. Hazrat Qureshi was having a meal that Maulana Abdul-Rauf, who was seven years old, came there. Hazrat Qureshi took him in his lap with love and gave him a mango to eat. Then he told his father that I have seen in a dream that I am building a wall and Abdul-Rauf and his two sons are helping me. Then he interpreted the dream that Abdul-Rauf and his sons will continue my mission after my death. Maulana Rafiq Ahmed is one of those two sons Hazrat Qureshi had foretold about. He is from the descendants of Hazrat Abdullah Ibn Abbas, the cousin of the Prophet of Mercy, may peace be upon him, and the family is called Qureshi. He received his education in various madrasahs in Multan, Karachi and Tando Allahyar. After completion of his Islamic education, he did Bay’ah in the Naqshbandi Path with Hazrat Khwaja Allah Bakhsh Abbasi Ghaffari Naqshbandi well known with the name Sohna Saeen, who also awarded him the complete khilafah after few years. After the demise of Hazrat Sohna Saeen, he did second Bay’ah with Hazrat Khwaja Muhammad Tahir Abbasi Naqshbandi well known as Hazrat Sajjan Saeen, the son and successor of Hazrat Sohna Saeen. He served as a teacher for three years, in the central madrasah in Allahabad sharif near Kandiaro, the khanqah established by his shaykh. Hazrat Shaykh Rafiq Ahmad Shah has two sons, Muhammad Shafiq and Fazal Ali. He resides at the illuminated khanqah of Miskeenpur sharif and sometimes travels to other areas for spreading the noble tariqah. Most of his time is spent in the missionary work of spiritual reformation of people and he has devoted his whole life to this noble cause. He teaches the Naqshbandi tariqah and propagates the message of Islam and the path of Sufism to many areas in Punjab as well as other parts of Pakistan. He arranges an annual Ijtema (gathering) with regard to the Urs of his grandfather Hazrat Pir Qureshi in the noble khanqah of Miskeenpur. This large gathering is attended by many thousands from all over Pakistan. While he represents the Sufi order founded by his grandfather which has millions of followers worldwide, yet his simplicity is so evident from his personality. His simple dressing code mirrors that of his grandfather and grandshaykh Pir Fazal Ali Qureshi who was known for his simple dressing even when he was the master of hundreds of Islamic scholars and shaykhs. This entry was posted in Pakistan, Punjab, Uncategorized. Bookmark the permalink. Dear brothers I am interested to know who is the realy sajjada nasheen of khanqah fazalia in miskeenpur? Because I read in another text that hazrat Pir Fazal Ali Qureshi has one grandson who is the son of Kaleemullah shah, his name is Muhammad shah qureshi sahib. And two grandsons from Abdurrauf shah, their names : Rafiq Ahmad shah qureshi and Muhammad rafiq shah qureshi…. and both ( Muhammad shah sahib, the son of Kaleemullah shah and Rafiq Ahmad shah qureshi, the son of Abdurrauf shah) are told as the sajjada nasheen and current shaikh of the khanqah e fazalia in miskeenpur. So please who can tell me whats the truth. I THINK IT CAN NOT BE REAL THAT TWO SHAIKHS ARE MANAGING ONE KHANQAH. SO ONE OF THEM HAVE TO BE THE CHIEF SHAIKH. Where can I find biographie of hazrat Muhammad shah Qureshi sahib, the son of hazrat Kaleemullah shah, how old he is…. and the biography of hazrat Rafiq Ahmad shah. and also I would be very happy if someone could give me more information about hazrat Abu Nasr Anas faruqi, the sajjada nasheen of khanqah e Abulkhair in delhi. Has hazrat Anas faruqi islamic education in a madrasalike darululums or not and if he has could someone tell me what kind of education? And also I would to know how can I get informations about the khulefa of hazrat Abulkhair faruqi (his sons hazrat Abu Sa’d Salim and hazrat Bilal, I readthat they lived lived in Quetta. I think it can be that they have khulefa there. Also who knows if hazrat Abulhasan Zaid al Faruqi had other khulefa as his grandson hazrat Anas faruqi. Also who knows where I can get info about hazrat Abdulhameed Jan sirhindi who is living in pakistan near hayderabad. Also who knows if khulefa of Muhammad Sa’id qureshi (khalifa of hazrat Pir Fazal Ali Qureshi) and khulefa of hazrat sayyid Zawwar Husain shah existing and their names and locations. There can be more than one Sajjada Nashin in one khanqah. One of the sajjada nashin of Miskeenpur sharif ís Hazrat Rafiq Ahmed Shah Qureshi Fazali Tahiri Naqshbandi, khalifa of Hazrat Sajjan Saeen. He is an Islamic scholar, having studied in the madrasah at Allahabad sharif and other places. There are many Shaykhs in the silsila of Hazrat Khwaja Fazal Ali Qureshi, who had many khulafa. According to my knowledge, the most well known and the chief shaykh in this noble silsila is Hazrat Khwaja Muhammad Tahir Abbasi Bakhshi Naqshbandi alias Sajjan Saeen, the present shaykh at the Allahabad sharif khanqah, near Kandiaro in Sindh. I do not know about the other shaykhs you have mentioned. I have merely heard their names. Regarding your question about Sufi Raqs, I think you are mistaken. Most traditional scholars as well as Sufi shaykhs have permitted the Sufi Raqs, which is a way to show happiness over the blessings of Allah and to make Dhikr. But unlike other tariqahs, the Naqshbandi tariqah does not promote it and we do not make Raqs collectively with Dhikr (as the Shadhili tariqah shuyukh make it). But to say it is haram or unlawful is completely wrong, as there are numerous proofs in the Hadith and books of scholars and Sufi masters about the Sufi Raqs. Here is a link with proofs from the Ahadith. There are many people who dance under spiritual ecstasy, without their own intent and power. They are powerless due to extreme spiritual ecstasy, so the Shariah does not apply over them. This kind of Wajd (or Jazba) has been prevalent in the Naqshbandi masters. During the times of Khwaja Fazal Ali Qureshi, thousands of his murids would be overwhelmed with Jazba. Some would jump, some would dance, some would laugh, some would weep, and there were many other forms of Jazba. Even in the Suhbat of Imam Rabbani Mujaddid Alf-e-Sani, there was too much Jazba and people were jumping all around. The Suhbat of Hazrat Ghaus-ul-Azam was so powerful that many people would die out of Jazba and extreme Fayz of Hazrat Ghaus-ul-Azam. There are numerous examples of this type of Raqs or uncontrollable movements in the Sufi books. I have myself seen people who become unconscious or who jump and dance unconsciously in ecstasy (Jazba) in the Suhbat of Hazrat Sajjan Saeen. Some people start dancing to copy those who are in real Wajd. This is called Tawajud and is also allowed by Sufi masters under the condition that it is made with love and Ikhlas, and is done habitually or regularly. The dance which is forbidden in Shariah is one which includes immoral movements and is done for bodily pleasure and entertainment. Also note that Hazrat Khwaja Sajjan Saeen is also a great Islamic scholar, and hundreds of his khulafa and murids are Islamic scholars. Many of them are Muftis and have written many books. The central madrasah at Allahabad sharif is a great Islamic madrasah recognized by the government and the madrasah board of Pakistan. So if the Wajd and Jazba which you saw in the video was haram or forbidden, those scholars would surely consider this and stop people from doing that Jazba. But all those scholars consider it lawful and praiseworthy to dance in Jazba out of love and spirituality. aoa.i ,today,checked your majl.you are right that the original sajjada nasheen is SHAIKH MUHAMMAD SHAH. (SON OF SYYED KALEEMULLAH SHAHSAHAB+HIS YOUNGER BROTHER HAZRAT AHMAD SHAH SB).the main problem,after the daeth of HAZRAT FAZAL ALI QURESHI,THE FIRST SAJJADA NASHEEN WAS SYYED KALEEMULLAH.THE OTHER PERSONS WERE NO TERMS WITH HIM.after the death of shah sb ,his elder son muhammad shah sb was nominated not only the sajjada nasheen of miskeenpoor,but also was also nominated as ameer of jamat fazlia ,throug out the worlld.his younger brother SHAIKH AHMAD SHSH SBis also excellent shaikh. Shaykh Anas does not take people into Bayah that easily, he first sees your jazbah and sincerity in this Tariqah and then after much consideration he takes the mureed in the Tariqah. Bro it took me 2 years to become Mureed. Nevertheless, Shaykh Anas can fluently and beautifully explain the Maarifs and beautiful wisdom of Maktubat Sharif. Every Shab e Jumah there is Dars of Maktubat Sharif by Shaykh Anas. This happens after Khatme Khwajgaan. Hazrat Anas May Allah keep his shadow for upon us , he is a very balanced Shaykh. Without the ghulu of our barelwi brothrs and without the extreme of our deobandi brothers. He follows the way of the Khanqah sharif since the time of Hazrat Pir Mirza Mazhar r.a and people whether they are affiliated with Deoband or Barelwi they are his mureeds. The Mehfil of Shaykh Anas has such amount of discipline that its like would rarely be seen. Such Noor and Jazabah is felt in his company but Shaykh is always very humble in all his dealings. 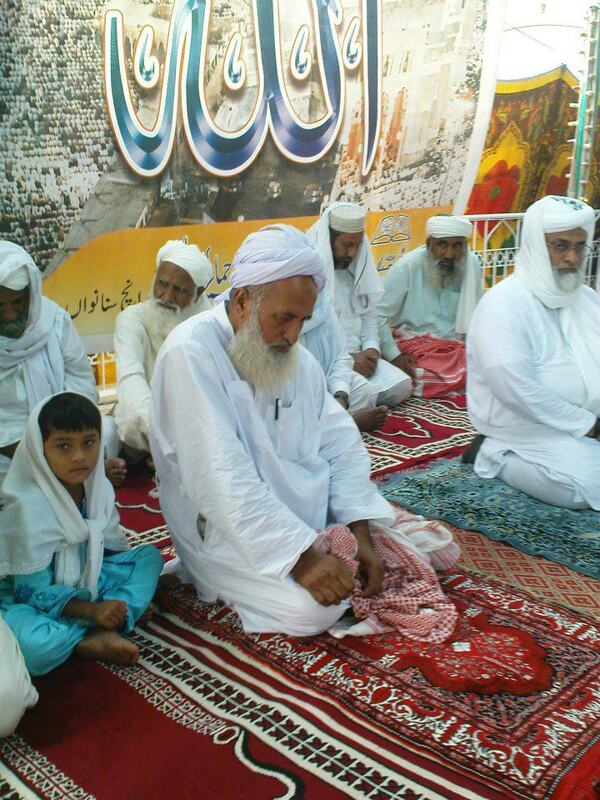 His son is a Hafiz e Quran and he is known as Agha Jaan Shaykh Ubaid. Hazrat Anas would be around 44 to 45 years of age. His shuyookh from whom e studied Islamic sciences are many and mostly from Bihar. He has traditional Islamic learning and is a great Ashiq e Rasool SAWS. You can see the Mehfil e Milaad sharif uploaded on youtube , but shaykh nhever desires any publicity. Humara kaam khamoshi ka hain. He also prescribes the Zikr e Qalbi and Tasbih to his Mureed and obedience to Shariah in all aspects. Shaykh follows Sunnah in every thing in life. We will never find any Bidah in this khanqah. No qawwali and no tawaf nothing of that sort. This state on this website I see today almost by chance. Sometimes I visit this site and read online some books like today but I don’t know how I came to this special site with these comments about the persons above mentioned. A short time before I was on google and whoops I was here but it is interesting what you describe about your shaikh. Well….I also know Hazrat Shah Abulhasan Zaid Farooqi “rahmatullahi alaih”. They have wonderfull publications I think but unfortunately most in urdu so I and I think very much muslims have no chance to benefit from these. I would be very happy if some brothers would translate it in english or arabic or farsi. especially the book about Ibnu Taymiyyah I want to read. Dear brother Ali Asghar Shah, are you doing zikr-e jahri or are you doing only zikr-e qalbi in your khanqah? I wanted to know since longer time what Hazrat Zaid Farooqi said or believed in such matters like namaz with microphone and qasida – nasheeds and zikr-e jahri? So do you know what about these things did Hazrat Zaid say or what is the practice in your khanqah? I think you know that the deoband school is allowing namaz with microphone but I heard they are not happy about gatherings for meelad-un Nabi “alaihissalam”. On the other side the Barelvi school is not allowing namaz with microphone but allowing meelad-un Nabi and other Qaseeda gatherings. I would like to know what Hazrat Zaid believed in these matters? I think their successor Hazrat Shaikh Anas will believe and teach the same. So please tell me the practice in your khanqah about these things. I myself love naats and also zikr-e jahri but I accept that zikr-e khafi is better. You made me interesting about Hazrat Shaikh Anas. Assalamu alaikum, dear Admin from this website. The comment above from Ali Asghar Shah was the reason why I gave a comment. I want to know a little bit more about his Shaikh and asked him to reply me or write to my email that I can take contact with him but I think it can be that he hasn’t seen my reply. So perhaby he will not seen or he will see after a long time. So please is it possible that you would write him an email to tell him my wish if you have his email. Due to give an email before sending a comment on your site he also must gave an email to you. Thank you very much. Can anybody tell me the contact no of Hazrat Abun nasr Anas Farooque RA ? I wish to do Baiyat on the hands of Hazrat Anas Farooque sahab . Does Hazrat Anas has put any conditions for those who want to be a Mureed of him ? I belong to India and want to becomes mureed in naqshbandi ways please guide me kamil murshid.